Carolina comes through during a quiet week! 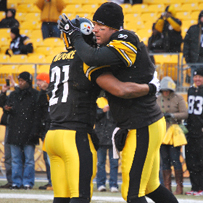 Carolina Quintero had great seats and her camera at the December 19th game at Heinz Field against the Jets. Now, the Steelers didn’t win, but we did with these great photos of Ben and your other favorite players, including some fun shots of the weekly “attack” ritual on Casey Hampton! You can check out her photos here. *Thank you so much, Carolina! Congratulations to Maurkice Pouncey, James Harrison, and Troy Polamalu on their selections to represent the Steelers at the 2011 NFL Pro Bowl on Sunday, January 30, 2011, at Aloha Stadium in Honolulu, Hawaii. Ben and teammates Heath Miller, Brett Keisel, Casey Hampton, LaMarr Woodley, and Ryan Clark are all Pro Bowl alternates. Thank you to all those fans who voted for Ben and his other teammates as well! “I look like I went 12 rounds with (Manny) Pacquiao. I guess I’ll be having a little surgery in the morning to get it fixed.” — Pittsburgh Steelers quarterback Ben Roethlisberger on the broken nose he suffered following a hard hit at the hands of Baltimore Ravens defensive tackle Haloti Ngata earlier this season. The next week, Roethlisberger wore a face shield on his helmet. You can check out more great quotes from their list here.